Ian Giles. Founder member and Chair person of the group. “Since being Born in May 1961, I have lived in Sidcup and Bexley. My Schooling started at Halfway St Infants then onto Burnt Oak Lane Juniors and finally ending at Hurstmere Secondary School. My career has seen me working for over 35 years in the Insurance industry based in the City of London and in 2011 I formed my own Company, Sudomem Limited, offering a variety of services to Lloyds Brokers, Underwriters and Insurance Companies based in the London market. Steve Jeal. My wife Maureen and my Daughter are actively involved with the group and help me in my role a Vice Chair to coordinate the activities of the group. I am the Raffle king of the Ace of Hearts. 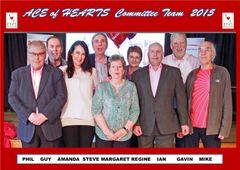 I'm Amanda Mitchell and I'm the founder of the Ace of Hearts Cardiac Support Group. Though I wont take the credit, as if it wasn't for the effort and enthusiasm from the committee and Jo Howe, from the British Heart Foundation, who all helped me put the group together, we wouldn't be here now....not forgetting their partners and families, who allowed them the time to plan with me to make all this happen. I am an Exercise Specialist with a keen interest in cardiac health. Most of the Ace of Hearts, will remember me from the 3 years I Lead the exercise and relaxation component for phase iii, in the community - Bexley and Sidcup. Also, set-up the Phase IV at Crayford Leisure Centre, where the Ace of Hearts was first formed over a cappaccino in Sainsbury's, after our Thursday class. My role with in the support group is assisting with coordinating of health speakers and helping with some fund raising events. I do some of the educational talks and join-in the annual BHF cycle and sports days. Regine Milkins. As you probably all know I am French and came to this country when I married Gavin in 1973. I have now been retired for three years. I am perfectly healthy but got involved with the AoH after Gavin had his "event"
I worked in a French bank in the city for 38 years as a PA. I organised events, booked meetings and made all travel arrangements for the office. I thought that my organising skills would ideally suit the role of the AoH guest speaker organiser for the Sunrise meetings that take place on the second Tuesday of each month. At the beginning of each year Amanda and I get together to decide the list of speakers we want to invite for these meetings. Amanda arranges the medical ones and I do the non-medical. I am proud to be French and don't mind some of the committee members (I won't mention any names) taking the "Mick" out of me from time to time. Après tout, je parle deux langues et ceux qui se moquent de moi ont du mal à en parler une. !!!! ... Ha ha ha ha !!!!! Gavin Milkins. After nearly 40 years working for British Airways as an IT Manager it seemed an obvious choice when I retired to become the Treasurer for a heart support group!! I look after the group’s money, pay any bills due and am responsible for documenting where all our income and spending goes. I became involved with AoH through the Phase IV classes at Crayford Gym which I have been going to for 4 years now - originally with Amanda our founder as instructor. Along with Guy I drive the Mini bus on our summer outings to the coast etc. Guy Beattie. Hi I am responsible for arranging and coordinating outings and events for the group. I am the question master for quiz nights. Together with Gavin I drive the BATS bus on our outings. All of this I do with the help and support of Elizabeth my wife.